I've seen and done some research regarding a race of Giants here on Earth or a race of "really tall people" descending from the race of Giants i.e the Nephilim as wrote about in the Bible and it really stands out to me because of the evidence which has been found. OMG there's loads of evidence with regards to a race of Giants and it beggars belief that they haven't been documented as such and instead just left by the roadside to make it's own way home so-to-speak? It's really sad but the truth. Proof of a Giant race of people. The Old Testament is filled with some strange occurrences. Sure, it has its plagues and its floods, but did you know Moses lived to be 120 years old? Of course, that’s nothing when you consider that Methuselah lived to be 969 years old. And who could forget that classic from Kings 2:23-25, when God sent two bears to kill forty-two children for mocking a man for being bald. Another odd occurrence in the bible was the appearance of giants known as Nephilim. "The Nephilim" were on the earth in those days and also afterward when the sons of God went in to the daughters of humans, who bore children to them. These were the heroes that were of old, warriors of renown” Genesis 6:1-4. "We saw the Nephilim; and to ourselves we seemed like grasshoppers, and so we seemed to them." Numbers 12:32-33. So, who were the Nephilim? In the bible, they are the sons of God and the daughters of men, however that works. Loosely translated the word means “giants”, although some believe the word comes from the Hebrew word for “fallen”. Their presence in the bible has been interpreted many different ways. Some claim them to be the offspring of angels, while others claim them to actually be fallen angels. Most Sunday school students remember the story of “David and Goliath”, the young boy who slew the giant armed only with a slingshot. 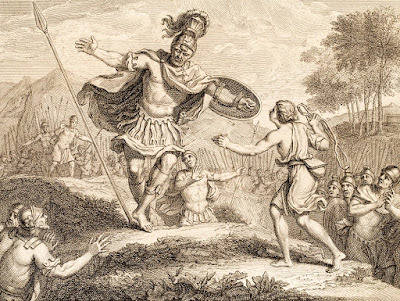 Goliath, the most famous of Biblical giants, was actually a descendant of the Nephilim, a Philistine warrior who stood nearly ten feet tall. 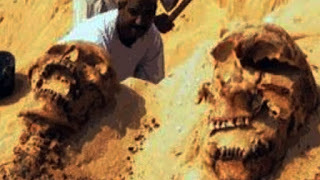 So were the Nephilim real? We have many, many examples of bones from what can only be considered as Giants? 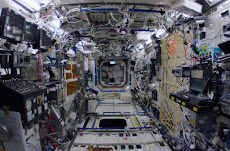 The bones are of immense size and structure. 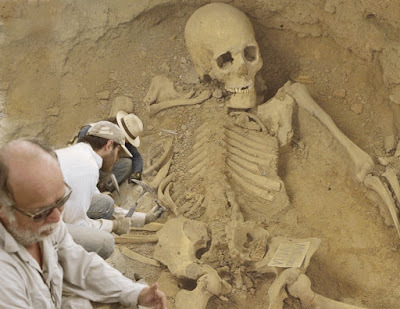 The first discovery of what may have been actual proof of the Nephilim’s existence happened in 1705. Massachusetts Puritan Cotton Mather strongly believed that bones found near Albany, New York actually belonged to giants who died in Noah’s flood. Paleontologists later debunked this claim when it was proven that the bones actually belonged to a mastodon. 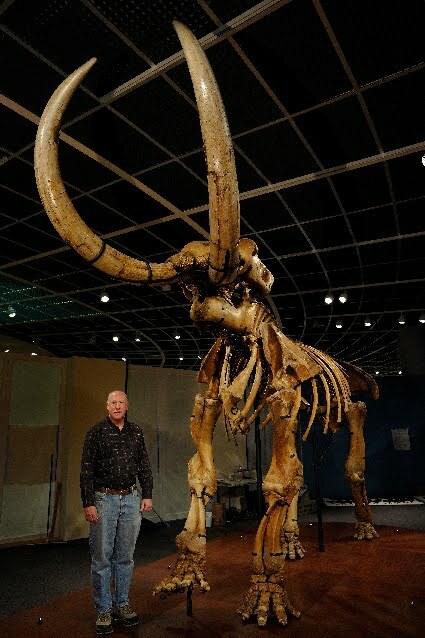 For centuries, fossilized remains of large animals such as elephants, giant sloths, and bison have been mistaken for giants. But for some, that still doesn’t dispel their supposed existence. In 1928, Peruvian archaeologist Julio Tello discovered an enormous intricately designed graveyard containing some of the largest skulls ever found. 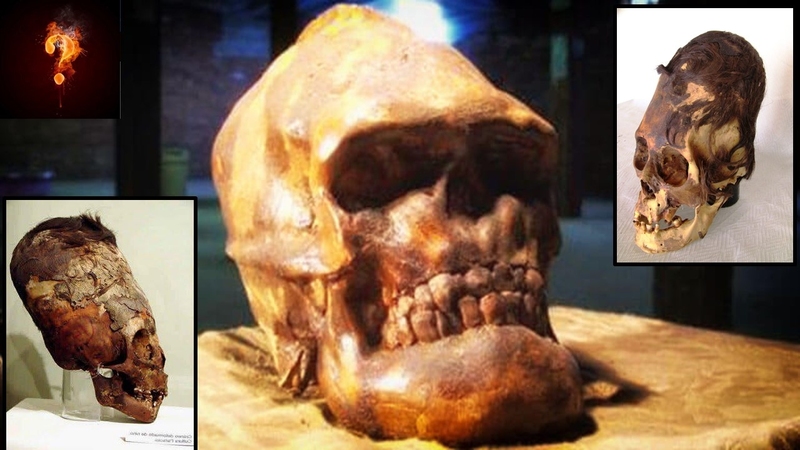 Some of the skulls were believed to be over 3,000 years old. A recent DNA test found that the DNA contained in these skulls had mutations unknown to human, primate, or animal. 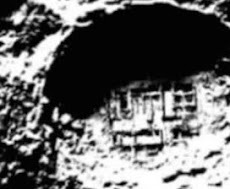 Had Tello found a Nephilim tomb? Many are still unsure, and scientists have yet to prove otherwise. The myth of the Nephilim has been kept alive for centuries by new discoveries every few decades or so. 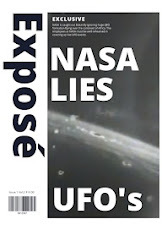 Although many have been debunked, there are still those that leave the question of Nephilim existence still open. 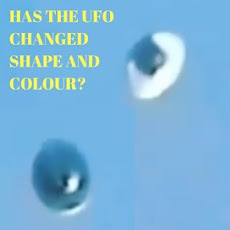 Around the early 2000’s, an odd discovery was made in Greece. 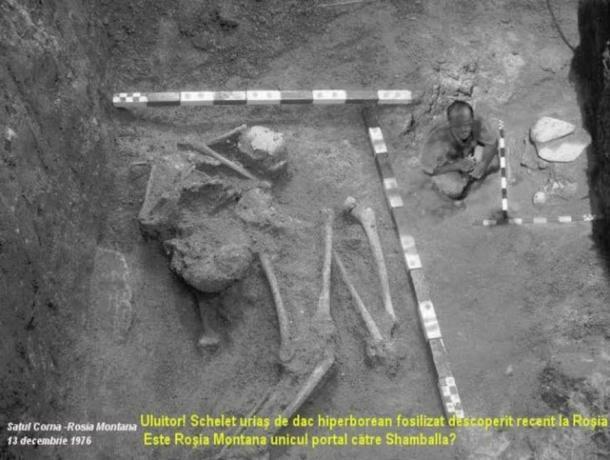 The skeleton of a fifteen-foot humanoid was believed to have been discovered near the northern border near Bulgaria. 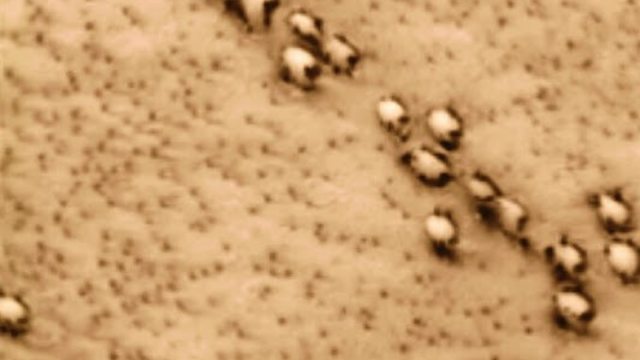 More recent findings have also cropped up in Saudi Arabia, Rome, England, and Wisconsin. About 12,000 years ago, a hefty 4-plus-ton mastodon (in the image above) took a wrong turn into a bog at what is now Marshalls Creek, near the Delaware Water Gap in northeastern Pennsylvania. It now is display and has no need to worry about getting bogged down with work or worrying about food, lol. What an amazing specimen though? It is a wonderful example of some of our earlist animals here on Earth. 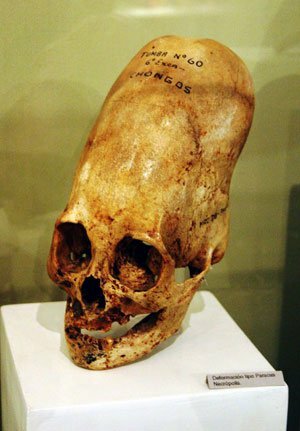 To the right you can see a really big elongated skull which was discovered by the greatest of Peruvian archaeologists, Julio Tello. He was excavating an area of the northern side of the penninsula specifically a graveyard when he found some really bizarre stuff which indicates that they either practiced head binding or these where actually star children, yes they were the skulls of children. So it begs the question, did this skull in particular have enough time to grow this big seeing as though it was a childs skull? My answer to that is no way. There's just no way this skull formed so quickly. Maybe a Giant child? Maybe if the children where from or a part of the ancient Giant race of peoples then this is maybe possible? 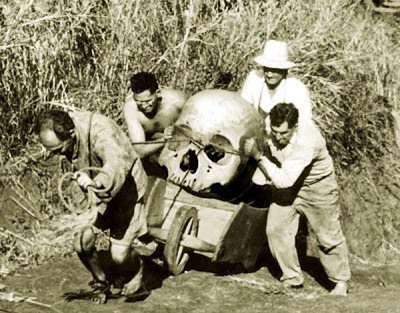 I say maybe possible because the growth of the skull bone is large, here we have a large skull which is bone therefore this could be a Giants skull and it could be part Alien because of the shape of it? 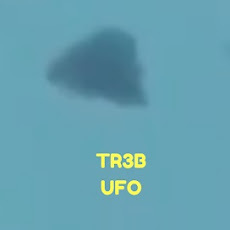 I'm only "initially" trying to connect the dots here so I could be wrong but my initial thoughts are that these could very well be the skulls of Aliens and Giants combined... An Alien Giant hybrid so-to-speak? In the eyes of some they could be seen as Gods? Here is a really interesting piece from the amazing Bible. The Nephilim were on the earth in those days and also afterward when the sons of God went in to the daughters of humans, who bore children to them. These were the heroes that were of old, warriors of renown. Genesis 6:1–4, New Revised Standard Version. The word is loosely translated as "giants" in some Bibles and left untranslated in others. The "sons of God" have been interpreted to be "fallen angels" according to some classical Judaic explanations. So that's why some people believe that the Nephilim are Demonic, fallen Angels and are bad. But some people believe that they are actually a race of Giants and since we have a lot of Giant bones, skeletons and skulls well it doesn't take a genius to work out which way my beliefs are being swayed does it? The proof and evidence will always trump any belief or beliefs, it's just the way it is in my own opinion. The reason for that is well, proof lol. I don't dismiss outright beliefs because a large part of history and todays world is based on beliefs and without our present and historic beliefs the world might just be a very different and very bad place? So in that respect I think beliefs have their own place and they have their own meaning. Some instances need a belief and some instances need a fact. In todays world they both have their own place and time of which I fully agree with. Giants are everywhere in the ground, their skeletons are making themselves known more and more. We've only scratched the surface quite literally it would seem? In Aramaic culture, the term niyphelah refers to the Constellation of Orion and nephilim to the offspring of Orion in mythology. J. C. Greenfield mentions that "it has been proposed that the tale of the Nephilim, alluded to in Genesis 6 is based on some of the negative aspects of the Apkallu tradition". The apkallu in Sumerian mythology were seven legendary culture heroes from before the Flood, of human descent, but possessing extraordinary wisdom from the gods, and one of the seven apkallu, Adapa, was therefore called "son of Ea" the Babylonian god, despite his human origin. 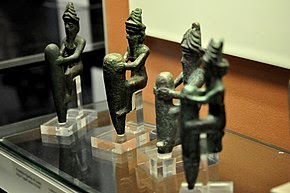 Four copper-alloy foundation figures dating to c. 2130 BC, depicting four ancient Mesopotamian gods, wearing characteristic horned crowns. The Anunnaki are very interesting also! 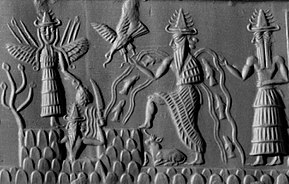 The Anunnaki (also transcribed as Anunaki, Anunna, Ananaki, and other variations) are a group of deities that appear in the mythological traditions of the ancient Sumerians, Akkadians, Assyrians, and Babylonians. Descriptions of how many Anunnaki there were and what role they fulfilled are inconsistent and often contradictory. 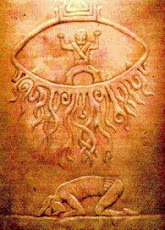 In the earliest Sumerian writings about them, which come from the Post-Akkadian period, the Anunnaki are the most powerful deities in the pantheon, descendants of An, the god of the heavens, and their primary function is to decree the fates of humanity. In Inanna's Descent into the Netherworld, the Anunnaki are portrayed as seven judges who sit before the throne of Ereshkigal in the Underworld. Later Akkadian texts, such as The Epic of Gilgamesh, follow this portrayal. During the Old Babylonian period, the Anunnaki were believed to be the chthonic deities of the Underworld, while the gods of the heavens were known as the Igigi. The ancient Hittites identified the Anunnaki as the oldest generation of gods, who had been overthrown and banished to the Underworld by the younger gods. 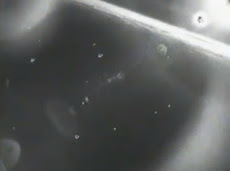 The Anunnaki have featured prominently in works of modern pseudohistory, such as the books of Zecharia Sitchin, and in conspiracy theories, such as those of David Icke. I found a website dedicated to the tallest people that have ever existed on Earth which can be found here. It stops short at telling us about the ancient Giants because I suppose it has to go on pure facts? Obviously an ancient race of Giants with their skeletons and DNA samples isn't enough, lol. I know that's laughable but I suppose we all have different ways of researching and researching on the side of caution instead of going with the evidence is one way? My way of researching is to go where the evidence/research takes me? Radical, I know, ha. 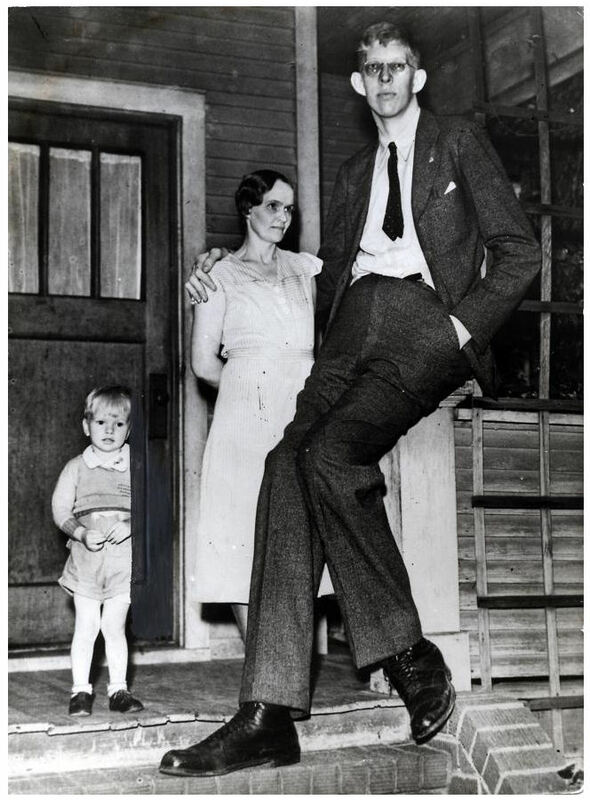 Say hello to the "official" tallest man in history. May 1936, Robert Wadlow at 18 years old with his mother and (half of) brother Harold Jr.
Robert Wadlow (Born Robert Pershing Wadlow on 22 February 1918 – died 15 July 1940) is the tallest person in medical history for whom there is irrefutable evidence. He is often known as the "Alton Giant" because of his Alton, Illinois hometown. Robert Wadlow reached 8 feet 11.1 inches (272 cm) in height and weighed 490 pounds (220 kg) at his death. Ten meters in height is not common at all. It is in fact a real rarity. This skeleton as seen in the image below is stunning. It's in comparison to the person next to it which makes it look extremely big, that's because it is really big. You won't hear about this stuff being taught in schools, colleges and dare I say it universities? In universities though at least you have more freedoms to look up and research your chosen subjects, but if you want to pass well then you have to reiterate the orthodox way of of learning and literally tow the line and become the very thing you thought going to university would prove your not, a Sheep!